Chicago, 1957. Italian-American immigrants Angela Rosa and Agostino Peccatori still cling to their old ways even as they cope with raising a family in an unfamiliar land. Angela Rosa has devoted her entire adult life to her children, while Agostino runs the corner social club and tavern, and often indulges his weakness for the ladies. Their oldest son Santo, newly graduated from high school, agonizes over becoming like his father, while his 16-year-old sister, Victoria, secretly meets boys and smoke cigarettes. But the conflict between tradition and assimilation is overshadowed when heartbreak strikes—a tragedy that sends the family on colliding and intersecting paths, and indelibly marks their lives. Tony Romano has been a high school teacher for 25 years. His fiction has appeared in the Chicago Tribune, Sou’wester, Whetstone, VIA: Voices in Italian Americana and has been nominated for two Pushcart Prizes. He is a two-time winner of a PEN Syndicated Fiction Project and his stories have been produced for National Public Radio’s The Sound of Writing series. He lives near Chicago, IL. Little Italy lives again in this mythical tale of love, life, and death. Romano has concocted a new brew from an old country recipe that reminds us all of the humanity inside the shared emotions that transcend time, nation, and culture. 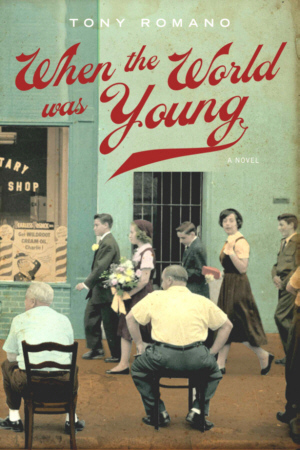 “When the World Was Young is a masterful evocation of a lost piece of American culture. The writing is sure and precise, the psychological and emotional insights always on target, the characters perfectly formed. Whether he is writing about a woman in labor, the intimacy of love, a streetcorner altercation, or a wrenching conversation between father and son, Tony Romano’s brilliance—as a craftsman and storyteller—shines from every paragraph. Simply a fine, fine book.